Mississippi Blues Free Ukulele Tab by Jeffrey Thomas. Many of my online ukulele students love learning and playing the blues. A student sent this version of “Mississippi Blues” to me by David Beckingham. The tabs do not have right hand fingerings which the student wanted so I created my own version with all respect to Mr. Beckingham. Follow my video tutorial for great direction and have fun learning this tune! Want the full ukulele tab for free? Just send in your email address using the form provided. Looking for great online ukulele lessons? Fill out the Schedule A Free Lesson form to set up your free Skype ukulele lesson today. 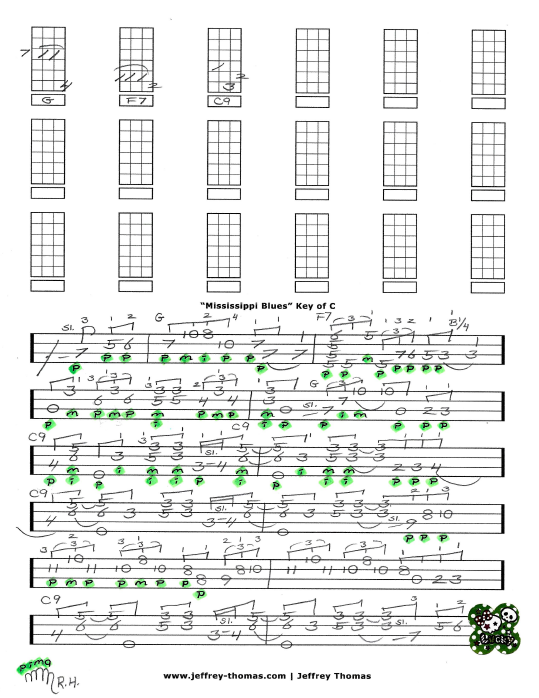 This is a really cool ukulele blues tab in the key of C. Find more great, free online ukulele tabs on my blog, tab and video pages.